Shares in Shire Pharmaceuticals have fallen 10% after its best-selling drug was withdrawn from sale in Canada amid reports linking it to 20 sudden deaths. Regulators said data showed 14 children and six adults had died after taking the usual recommended doses of hyperactivity treatment Adderall XR. Shire said it disagreed with the findings and remained confident in the safety and effectiveness of the drug. The Hampshire-based firm is the UK's third largest pharmaceutical company. Most sales of Adderall XR come from the US. In 2003 the drug, which is only available in North America, accounted for $474m (£255m) in sales, about half of Shire's total turnover. Health Canada said none of the deaths involving people using Adderall XR were in the country, neither were 12 reports of strokes linked to the drug. The US Food and Drug Administration (FDA) reviewed the same data as Health Canada last year, which resulted in a warning being added to the drug's labelling. Shire said it was looking at changing the labelling in Canada to stress Adderall XR should not be used by children or adults with heart problems. "The labelling updating with Health Canada was part of Shire's regular ongoing process of revising the product label with information gathered during the lifetime of the drug," it said in a statement. Shares in Shire closed down 10.05% at 593.5 pence. Drug regulators across the world are taking a tough stance on safety after a number of high-profile cases. In September, Merck withdrew its Vioxx painkiller after clinical tests showed it raised the risk of heart attacks. 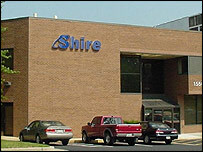 Analysts, however, do not think the Canadian decision will have a long-term impact on Shire. "Unless there is something lurking in the data that the FDA hasn't seen then it is unlikely to lead to a withdrawal in the US, which would be a massive blow to them," said Dr Jonathan Senior, of Evolution Securities.